When I saw this idea, I was super excited. Nothing is better than saving money on makeup, cuz that stuff is EXPENSIVE! Here is the original idea. The lady wasn't kidding when she said Kool-Aid is tart! I saw a tiny Vaseline container for lip gloss at Target and though it was perfect. I picked up the pink lemonade Kool-Aid also. 1. Mix 1/3 of the packet with the Vaseline using the cotton swab to stir. If you are doing this in an empty lip gloss container, fill the container up with Vaseline first, then mix in 1/3 of the packet of flavoring. Let sit for 1 hour so that the granules can dissolve. The lady wasn't kidding when she said Kool-Aid is more tart than Crystal Light. It was soooo sour! I ended up throwing mine away. I will attempt this one again, but probably not for a while! Next time, I will use Crystal Light. I have had this on my "food to make" list for quite a while, and finally buckled down and made it. I was doing a dinner of snacks, so I picked out a bunch of snacky foods, and this was the only one not prepared in advance. It's super easy, and really tasty! It makes a great snack or appetizer. Here is the original recipe. My version is slightly altered, per usual. 2. Rinse the spinach thoroughly in cold water. Chop into small pieces. 3. Spray a muffin tin with non-stick cooking spray. Form bread dough into bowl shape small enough to fit in each muffin tin bowl. As a side note, the refrigerated stuff forms a little bit better than the frozen dough. I couldn't make a bowl shape to save my life! The dough should be about an inch thick. 4. Pour the olive oil in a pan, and set to medium-high heat. Cook and stir spinach until wilted (about 3 minutes). Add in garlic powder, and cook for an additional minute. Remove from stove. 5. Combine cream cheese, sour cream, spinach, salt, pepper, garlic powder, and parmesan cheese together until well blended. 6. Scoop mixture into each mini bowl. 7. Pop into oven and bake 20-25 minutes, until edges of bowls are golden brown. I admit, this is not an original recipe, but it was a lot of fun to do. I got the cookie cutters at Target. 1. Place cookie dough roll on a plate. 2. Sprinkle flour on your table or countertop, and roll out a good sized piece of dough from the roll (big enough to cut out the cookie). I did this by hand, but you can use a rolling pin for a flatter finish. 3. Push the cookie cutter firmly down into the dough. Remove the excess edges and set aside. 4. Sprinkle sugar on top of sugar cookie. 5. Spray a cookie sheet with non-stick cooking spray. Place each cookie on the sheet, leaving generous space between each. OH MY GOD! They became sumo wrestlers in the oven! What happened? ALL of the cookies came out this way. With some quick thinking, and while the cookies were still warm, we re-cut the cookies a second time. They were a little rough around the edges, but aren't all ninjas? 7. Allow cookies to cool at least 20 minutes. Separate frosting out into bowls. Add food coloring to each bowl to get desired colors. 8. Frost each cookie, and decorate with icing. What are the most fun cookies YOU have ever made? I saw this a while ago and have been wanting to do it for so long! I finally was able to. The search for a rectangular potholder was easier said than done. I looked everywhere before I found one. So many times, I am traveling and I need to bring my hair straightener with me, but I have just used it and it is still hot, and I don't have time to wait for it to cool down so I can throw it in my bag. Simple fix--cover the hot part and pack it! Here is the original idea. 1. Lay your potholder out, and make sure it is long enough to cover the plate part of your straightener. 2. Remove any tags and fold potholder in half, the long way. 3. Starting from the corner with the fold, sew the bottom part shut using loops, to keep it more securely closed. 4. Continue sewing around the corner, and up the long side. 5. Stop sewing when you get to the second corner, leaving the top open. Here is the finished product, with the flat iron inside! I have never actually wished for whiter fingernails, but I found this great tip from my favorite magazine, Marie Claire. After using a nail polish color for a while, or leaving it on for an extended period of time, it can leave behind a yellow color on your nails. This is a quick fix! Repeat every 6-8 weeks for best results. 1. Mix hydrogen peroxide and baking soda together. 2. Apply the mixture thoroughly to your nails, and let sit for 3-5 minutes. 3. Rinse off mixture with warm water. I can tell the difference--can you? And now, the long-awaited London post, starting with some common stereotypes! *The British have bad teeth. False. The people I met/encountered had normal teeth, although they did take the time to explain this stereotype, which I am grateful for! Apparently, with socialized medicine, only a few dentists are covered under that. Thus, it can take months, and even years, of being on a waiting list to see one of those dentists. The British are so accustomed to not paying for healthcare, that the idea of seeing a teeth specialist and having to pay for it seems utterly ridiculous. Makes sense, huh? *The British are extremely polite. True. For the most part, all the Brits I met were very nice and very polite, except one guy who I encountered at a Burger King in London. He wouldn't take my debit card because it had a crack in it, so he handed it back to me and said, "We don't take cheap cards here," and he refused me service. Oh well, it was only BK--can't expect loads of kindness from a fast food place. *It's always raining in London. False. Although the weather is highly unpredictable, I am told it does rain quite a bit there. It rained on and off pretty much the whole time I was in London. *Those double decker red buses are everywhere. True. The red buses are not only tour buses, but also the main bus transport in London. You see them quite frequently. *Everyone eats fish and chips. False. It is a popular dish, for sure, but not EVERYONE eats it. Although the ironic thing about that is I went to order some at a pub, and they were all out. So everyone must have been eating fish and chips that particular day! The British are fond of meat and potato/veggie dishes though. Day 1: Friday, July 13th, 2012: I must preface this by saying that per my earlier blog, the U.S. did win the bid for Miami! So, in 2016, Miami will host the World Federation of Hemophilia's Congress! Woohoo! I am so psyched about that. So, Friday morning, I woke up early, packed up my last minute things, and checked out of my hotel in Paris. I took the Metro to the Gare du Nord, or North Train Station, where I would be taking the "chunnel" from Paris to London. When I arrived, I saw a huge billboard of all the departing trains, and located mine, which would be departing to St. Pancras, London at 11:47am. It was pretty cool and exciting. In fact, the area I would be staying in was Stratford, where the Olympics are taking place. Now, coming to London, I didn't know a single person. That was kinda scary, but I had done my homework beforehand. I started using a website called CouchSurfing (www.couchsurfing.org). Basically, you can search for people to host you on their couch for a number of nights. It's a really cool site, and I highly recommend it. You have to make a profile and everything. I met my host, Miles, from there, and he graciously offered his air mattress to me. When I got into London, I checked the time. It was about 2:00p. I had to meet Miles at the Stratford station at 6:00p. I decided to see as any things as I possibly could before I had to meet him. I had been looking at a map of tourist-y London places while on the train. I compared that map to a subway map, and circled the stops where those places were. The first place I headed was to Baker Street. I had heard from someone that there really was an address on Baker Street where Sherlock Holmes had lived. Now, for the life of me, I couldn't remember what that address was, but I thought I would take my chances. The subway, or "tube" was very navigable. I got off on Baker Street, and walked a little until I saw a whole bunch of cafés and restaurants named after Sherlock, so I knew I was close! Across the street I spied 221B Baker Street, otherwise known as the Sherlock Holmes museum. Bingo! I crossed the street and took pictures. The line to get in was long, so I moved on to stop # 2: Abbey Road. I got off at the Abbey Road stop. My only regret was that I didn't have 3 friends with me so that I could re-create the famous Beatles album, Abbey Road. Many people did this, stopping traffic quite frequently. Miles later told me that the pedestrians did have the right of way, even if they were taking pics and being tourist-y. My next stop was Buckingham Palace. Now, keep in mind that I didn't have a place to stow my luggage, so I was getting pretty tired from lugging it all over the place with me. I asked for directions from a nice British gentleman, and he directed me through a park, about a 10 minute walk. It also had started to rain. I made it to the palace and took some pictures. The palace was very big and impressive! I did a time check, and it was a little after 4p. I decided it was best for me to start heading back to Stratford station, so that I could meet Miles on time. I took the tube, and arrived to Stratford. Amazingly, they had wireless internet, so I was able to get online for a while and entertain myself. I sat for a good 45 minutes, until it was close to 6p. Then, I moved my suitcase and myself into more of a plain view. Miles spotted me first, and came right up to me. I extended my hand, but he instead went in for a hug. I liked him immediately, as this was a typical move I would do! We dropped off my luggage at his house, and he introduced me to some of his housemates. One of them, Izzy (the only girl), tagged along with us, so I was excited. We headed out, our gameplan to pick out some food to make for a real British meal. We talked all about stereotypes of Americans and British. We had a good few laughs from all of that. We walked through Stratford and found some cool stuff, like the Olympics mascot. Also, we went to see where the Olympics were being set up. We couldn't get too close, but it was still pretty cool. Miles and Izzy told me they were both sick of the hype already. I can only imagine! Next, we headed to a pub. I got to try my new favorite beer, which is a flavored cider called Kopparberg. It's not from London, but it was so light and fruity, it didn't even taste like alcohol! I smuggled one of these home in my suitcase. A real British meal, homecooked! We had potatoes, stuffing, veggies, meet, and those bread looking things are Yorkshire puddings. Sooo good! I went to bed so full that night! Miles and I stayed up pretty late just talking about random things. We decided we were going to sleep in late, since we both were feeling a bit sleep deprived. Day 2: Saturday, July 14th, 2012: We slept in until about noon, which was a lot later than I think we had intended! All the same, the sleep felt great. We quickly ate some lunch, got ready, and headed out. Miles took me to this place where we would see a lot of street performers. We saw a lady who hung upside down and juggled knives. We also saw a guy from the U.S. that called himself Arizona Jones. He had a fedora, a whip, and everything. He called Miles up to help him with his tricks. But, it started raining, and he was forced to pack up and leave without having done his finale. Next, we headed back in the direction of Stratford station because we were meeting up with another awesome guy I met through Couch Surfing. His name is Mo, and he is a wonderful person. Miles spotted him based upon my description, and we went out for coffee (tea for me). We had a GREAT conversation, and ended up playing all kinds of card tricks. I screwed mine up though, haha. Then, Miles showed us his devil sticks performance. He is really good at them, and was showing Mo and I how to do them as well. You basically have two sticks and you need to keep a third one in the air and twirl it with the first two. It is a lot harder than it looks! After meeting Mo, we headed out to get some lunch at Wetherspoon (a popular local pub chain). I had some steak and kidney pudding and a cloudy, unfiltered cider the locals call "scrumpy." I love cider so much, that I even liked the scrumpy. My first choice of food was actually fish and chips, but they were all out--sad! I want to make this at home though--doesn't it look good? Steak and kidney pudding: a real London meal! After lunch, we headedback to Miles' apartment to get all fancied up. We were going to an event at a famous London landmark called the Gherkin. We were invited by Miles' friends, but had no idea what it was all about. But hey, I love any excuse to get dressed up! We arrived at the Gherkin, and discovered the event was being put on by a group called Hello. We heard other people around us asking what Hello is. It was definitely funny that we were not the only ones who didn't know! I got to meet a few of Miles' friends who were pretty cool: Joe and Jamie. We mostly hung out and talked in the upstairs bar lounge. We also had some fun with the props available to us. After a few hours, we decided to head back before the last of the trains stopped running for the night. It was another great night! I must admit that before I ever took French (and even when I started taking it in high school), I had my stereotypes. I will shed some light on those, and let you know if they turned out to be true or not. *French women do not shave their armpits. False. That may have been true at one time, but all the women I saw seemed to be rather hairless there. I think that being hairless in more in style than ever these days, even in Europe. But there are exceptions to that as well. So if you can’t get to a razor, don’t sweat it—you will blend right in. *Everyone wears a beret and or/a striped black and white shirt. False. I saw only one French guy with a striped shirt, and no beret. I saw an American group of students all wearing a beret so that they could easily locate one another. All the other berets I saw actually were sold in touristy shops in every color imaginable. *The French are rude to Americans. False. No French person was rude to me, either of the time I have been to France. Everyone was very kind and helpful. I also speak French, so that may have made a bit of a difference! Like I said, learn some phrases to help you get by, and you’ll be just fine. *Accordion music plays everywhere you go. False. You can find old time French music in restaurants and things, but there are really no speakers blasting it across the land. *Frog legs and snails are a delicacy. True. You can order snails (escargots) pretty much anywhere you go, and they are usually served with garlic and butter. The frog legs are not as commonly found on menus, but they are actually really good. They taste like chicken, and you can usually get them fried with a batter of some sort. *Everyone smokes. False. Not everyone smokes, but you will see people smoking, and from a young age. It’s still not as taboo in Europe as it is here in the U.S.
Day 1: Saturday, July 7th, 2012: The city of light, the city of love. Paris is one of my favorite cities in the world. The moment I stepped off the plane and onto the airport ramp, I was giddy and I felt like I had stepped into a magical place. All around me, I could hear people speaking French, and I saw signs in French all over the place. This was my own personal Disneyworld. I met up with my friend Chad, and we set out to explore the city. The funny thing is, it rained off and on all day. It wouldn’t rain while we traveled to things, but the moment we got to a site, it poured. This happened at least 3 times! Our first stop was la basilique de Sacré Coeur de Montmartre. It is a large basilica with a great view that overlooks the whole city. It’s absolutely beautiful. Next up, we went to La Tour Eiffel. You can spot it from many places around the city, but there is nothing quite like standing right in front of its majesty. It’s an architectural wonder, and the very symbol of Paris. Lastly, we went to la Cathédrale de Notre Dame. We didn’t go inside, because the line of people, much like the Eiffel Tower, was insanely long. We took some good pictures from afar and went along on our way. For dinner, we stopped and ate at a nice little restaurant called Rendez-Vous Des Artistes and I ordered the classic Croque-Madame. It’s basically a croissant sandwich with ham and cheese, and an egg on top. And to drink, Orangina. My absolute favorite drink! It was delicious. After all that walking, I got back to the hotel and just plain passed out at about 10:00p. Day 2: Sunday, July 8th, 2012: I woke up at about 10a. Wow, I really slept 12 hours! I met our group in the lobby and was introduced to those I hadn’t previously met. We all headed to lunch at a nice restaurant. We discussed our game plan for the week. Then we had a multiple course meal. We split appetizers, (escargots (snails)—soooo amazing! They were in a garlic butter sauce!) food (I ordered duck), and dessert (crepes and mille-feuille, or “thousand layers”: a pastry with layers of flaky thin crust sandwiched between a thick vanilla cream). I also had eau gazeuse (or carbonated water, which is amazing. I love the bubbles!) Eau plate means flat water (no bubbles). Then, I headed over to the convention center (Palais du Congres). I couldn’t find the room where my reception was. Embarassing! I finally found it after asking like 4 different people. The opening ceremony for the conference began, and it was really exciting! Afterwards, I attended a dinner where I learned of a program called the Buddy Awards. It’s given by someone with a bleeding disorder to someone in their life who is a hero, and has helped them to cope and make their life as normal as possible. I love the concept. I was finally learning my way around the subway system! Day 3: Monday, July 9th, 2012: I woke up early and headed to breakfast. 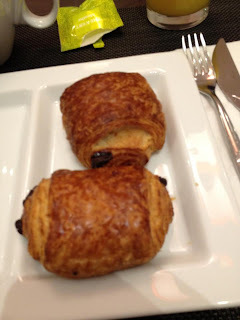 I loaded up on chocolate croissants (My favorite! I could eat those thing non-stop, all day, every day). I attended a few morning sessions, and then I headed out for adventure part 2. As a side note, I was asking for directions at the conference center, and got hit on by a French boy! Woohoo! Although Chad and I did a whirlwind tour of the city, and didn't actually go into most of the touristy places, we got good pictures and we saw a LOT, which was perfect. We met under the Arc de Triomphe. Underneath the arc is a tomb of an unknown soldier who died fighting for France. Next, Chad and I walked the famous strip of expensive stores, the Champs-Elysées. They have Louis Vuitton, Chanel, and many other stores. We didn't really go in any (I shopped there later in the week), but we walked past and headed out to see some more great places around Paris. We went to Place de la Concorde, the garden of Tuileries, and the Louvre, which are all right next to one another. I have been in the Louvre before and seen the Mona Lisa and the Venus de Milo. It's a huge museum, and impossible to see everything, even in a day. It is said that the French do not like the glass pyramid that makes the Louvre so recognizable, because it's modernity clashes with the old architecture of the museum itself. Then, we headed over to another famous museum, le musée d'Orsay. I am not big on museums, but maybe next time I am in Paris I will go here and actually go inside. For dinner, we originally were going to go to le Moulin Rouge. It seemed pretty cool from the outside, and I took some pics. However, we got there, and it was all sold out and we didn't have a reservation. So, the staff sent us to a place a couple blocks away that still had dinner and a cabaret show. We saw the prices and freaked out: 130 euros for dinner and a show. Yikes! We ended up going to a nice little place called La Cloche d'or (the golden bell). We we went to a nice restaurant where Ian and I fully utilized our French speaking skills. It was such a nice conversation, and intimate setting! I got a steak, and green beans. It was really tasty. Our waiters were really cool also, and were glad Ian and I spoke French. They told us they once had some southerners and could not understand their accent very well at all. Funny! What an amazing day it was. Day 4: Tuesday, July 10th, 2012: Ian and I attended a great youth session, in which several youths talked about their experience getting young people involved in their local NMO, or national member organization. Afterwards, I made it to our booth, where we were handing out educational materials. The exhibition hall itself was huge, with many booths set up. 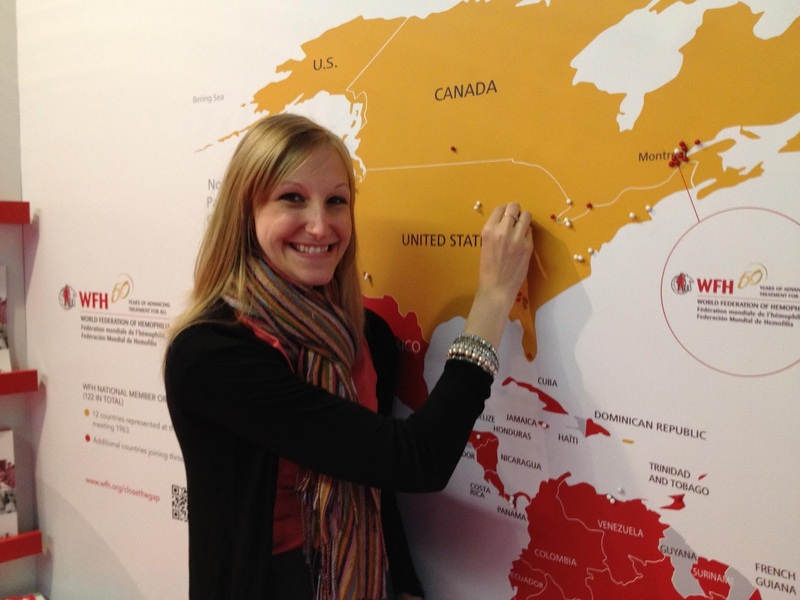 I made a donation to WFH and got to have my picture taken in front of the world map. I was the only Wisconsinite! Some booths gave out goodies, drinks and snacks, which was cool. I talked to a lot of people and did some serious networking. At night the cultural event was held, in which the host city gives the conference participants a taste of the culture. So, we saw a cool show with a band that played French music, cabaret dancers (pretty sure 2 of them were guys, but no judging), a mime (hilarious, not the old fashioned type you would imagine), and some amateur acrobats who did handstand and somersaults. Afterwards, there was a cocktail reception with hors d'oeuvres. My friend Ian actually had a friend in town, so we went and met up with her and some of her friends for dinner at a restaurant. I had the most amazing burger of my life, and it had a chef's special house recipe sauce. Some really funny moments of the night happened here. I thought the name of the restaurant (La Souris Verte) translated to "the green smile." Actually, it ended up being the green mouse, a slightly less weird title. Sourire is the word for "to smile." I don't know why, but that was exceptionally funny to me. Secondly, I got a delicious chocolate mousse for dinner and inhaled it in under 2 minutes. Chad kindly offered to share his dessert, and after he did I realized I had none to offer, and so I declined sadly. He asked me, "Are you declining because you would offer me some of your dessert, but it's GONE?" We both cracked up about that one. And finally, we were going to play the French version of bocce ball, called pétanque, but it was too late and parks had closed by the time we arrived for dinner, and so Chad remarked, while waving a fork around with a potato on it, "I really wanted to play...uh...P..." and Ian, seeing the potato thought he was trying to say it and filled in, "Pomme de terre?" After I explained that Chad had meant to say pétanque, not potato, we all had a good laugh. Day 5: Wednesday, July 11th, 2012: I attended a session called Women's Voices. This was a really cool one, because it was basically a bunch of women from all walks of life and all over the world discussing their experiences, successes, and challenges living with a bleeding disorder. I attended a lot of sessions throughout the day, and then I snuck out for a few hours to do a little shopping on the Champs-Elysées. Our group had a reception and dinner to attend this night, so I went to that. The reception was at Pavillion Elysée Lenôtre, and dinner was at Foquet's (funny in English, right?) I remember on this particular night I drank a lot of champagne, because the waiters kept coming around and filling up my glass when I wasn't looking. I couldn't tell you how many times that happened, mainly because I don't remember. I had red wine, white wine, and champagne. Let me tell you, the next morning was definitely not a good one. But, it was a lot of fun, and worth the lingering headache. Day 6: Thursday, July 12th, 2012: The last full day of the conference. It's funny because I went to H&M, which we have in the states, but shamefully, I couldn't tell you if we had the same products or not. It was cheap, and so I bought some cool stuff: 3 cocktail rings, a necklace, 2 dresses (an orange one and a pink zebra one), a neon pink skirt, and a pair of bright blue heels. I also bought a pretty rainbow Egyptian themed necklace from Zara (we don't have those in Wisconsin at least). We had the cultural dinner at the Pavilion Dauphine. This night I got to hang out with our group a lot and I really got to know everyone so well, including my 3 new adoptive moms who I absolutely adore! The Pavilion Dauphine was beautiful. There were tables set with a silver candleabra holding white and blue candles, blue flowers, and blue bottles of water. We were served a salmon appetizer, guinea fowl for dinner (the only meal i didn't really care for very much), and a pastry type dessert with pistachio. Then, the dance floor opened up. I took a lot of pictures there. I love the dancing part because there are so many people from all over the world dancing, all brought together by a universally spoken language: music. I think the U.N. needs to have a giant dance party. It would really break the ice. Now here is some trouble: the three young Americans: Alex, Ian, and I. Overall, I had an amazing time in Paris, and the vote for the bid would take place in the morning (Friday), and I would leave for London! Stay tuned for my London adventure up next!